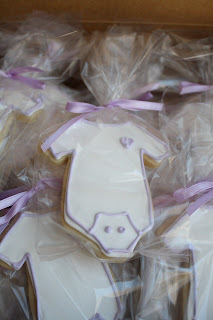 For this baby girl shower they wanted purple and pink baby girl cupcakes with some yellow accents. Half the cupcakes are chocolate and the other half are yellow. I also made onesie cookies to coordinate with the cupcakes. 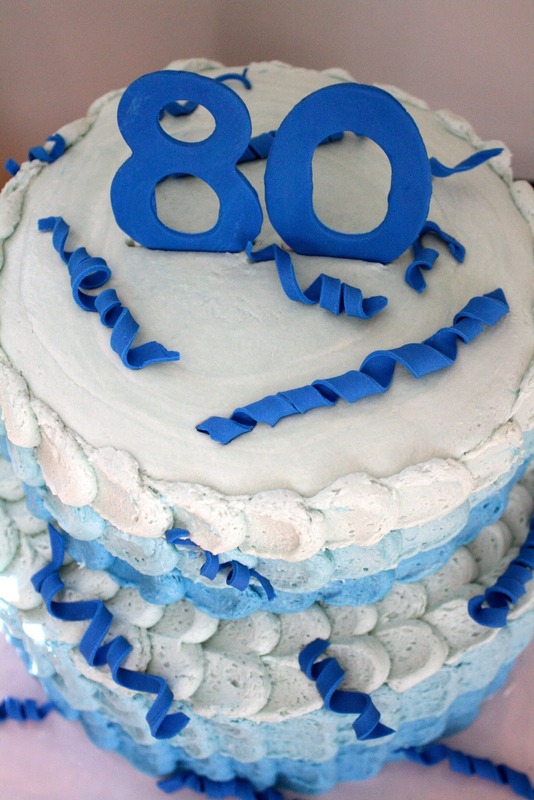 This cake was for my Nana's 80th birthday. 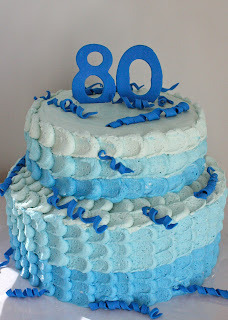 She has always loved the color blue and was very proud to be turning 80. So I went with a lot of blue and a big blue number "80". The bottom tier was lemon cake with buttercream filling and the top tier was marble cake with buttercream filling. Happy Birthday Nana Jean, we love you! Goodbye Rosa, we'll miss you! This cake was for a very special lady's retirement, Rosa. Rosa has worked for my parents at our family restaurant since I was a year old. Each and everyday she would come in and make the tiramisu, arancini and so many other yummy things. I could always count on her to squeeze my cheeks and call me "bella". Finally, at the age of 80, she has decided to hang up her apron and move to sunny Florida. So here's her marble cake with buttercream filling and icing, complete with her apron, knife, rolling pin, a tomato and bowl of spaghetti and meatballs. This cake was for my husband's birthday. His favorite candies are Reese's pieces and Reese's peanut buttercups. 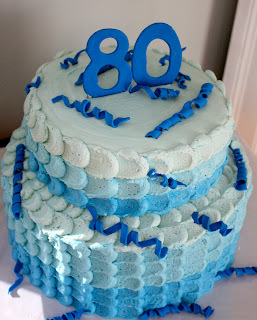 This cake was the perfect way to get my kids involved in making their Dada's cake (they're only allowed to help with family members' cakes). 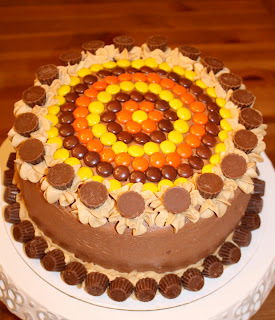 They sorted the pieces by color, and my 4.5 year old daughter arranged the pieces and peanut buttercups on the cake. It's a chocolate cake with peanut butter buttercream filling and chocolate buttercream icing. They were so proud of the cake, and he loved it. Happy Birthday to the best husband and father!